Following yesterday's clockwise circumnavigation of Virgin Gorda, day two of the Loro Piana Caribbean Superyacht Regatta & Rendezvous saw the 20-strong superyacht fleet complete a second round-the-island race, this time sailing anti-clockwise around the BVI's third-largest land mass. The YCCS Race Committee set a 29 mile course for divisions A and B, while division C sailed a slightly shorter course of around 27 miles, cutting inside Ginger Island at the westerly tip of Virgin Gorda. Conditions were once again ideal with the southeasterly breeze holding at around 14 to 17 knots. The 34m Baltic Nilaya, boasting VOR campaigner Bouwe Bekking on tactics, and the 27.7m Frers-designed Freya, with tactician Mike Toppa, provided consistent performances in divisions A and B respectively to hold on to the top spots they gained yesterday. 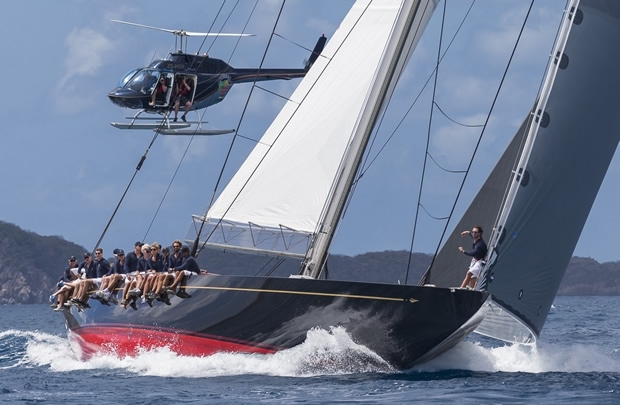 Division C saw yesterday's winner Tempus Fugit take fourth place while the 37m Dubois Moonbird claimed her first bullet to move up to first place overall in the division on equal points with Sarafin. Racing in the event, organised by the Yacht Club Costa Smeralda and Boat International Media, is set to conclude tomorrow, 22 March. Don MacPherson, owner of Freya, was satisfied with today's second place finish which, combined with yesterday's bullet, leaves the Swan 90 with a four point lead over the 54.6m Marie in second. MacPherson commented : "It was just a delightful day today. Flat water and consistent wind, a lot of great boats and really a lot of fun. It's wonderful here in the Virgin Islands, it's the best, there's nothing quite like it. Virgin Gorda is a fantastic island, we've raced it clockwise and counter clockwise and to be here at YCCS is just spectacular, it's one of the best yacht clubs I've ever been to." Asked of his hopes for tomorrow's final race, MacPherson remained cautious: "Each day is a new day so you've got to work it from the very beginning, we hope for the best and we'll get up early and do it again." America's Cup veteran Francesco de Angelis, racing aboard the J-Class Rainbow with Pier Luigi Loro Piana in division A, gave an insight into the tactics involved in today's race: "It was a downwind start so something that you usually don't practice too much and you have to make sure you don't make any mistakes there. Tactically, each boat has its own problems given the size and the start order. Sometimes you have to understand how best to deal with bigger boats overtaking you, and the other thing is around the corners, sometimes there are islands like the one we rounded after the first leg, Ginger, which is quite tall so you have to negotiate the shadow. Other than that it was pretty straight forward. It's a fantastic venue: the Race Committee can make different custom courses every day, the venue is fantastic, very enjoyable." Exciting on-the-water action continues to be complemented by an exclusive social programme with owners, guests and crews attending a Beach Party at the nearby Oil Nut Bay resort this evening. Participants will then enjoy the Yacht Club Costa Smeralda's impeccable hospitality once again at the final prize giving ceremony.